My husband gets full credit for this one. He knows how much I love Thai baby coconuts. He also sees the splatters on the kitchen ceiling from my opening skills. I will say I’ve gotten pretty good at opening them up over the years; wielding my knife, slicing down the husk to a very thin layer on the top, and then chopping full-force into the lid area and prying open the top. But sometimes it can get messy: the sprays across the cabinets, ceiling, people and pets have all been part of the process. I never have lost any fingers, but it sometimes seemed a bit dangerous to slam a huge knife into a sometimes unstable object. So when my man found the Coco Jack, he ordered one for me as a surprise. I have to say that I absolutely love it. 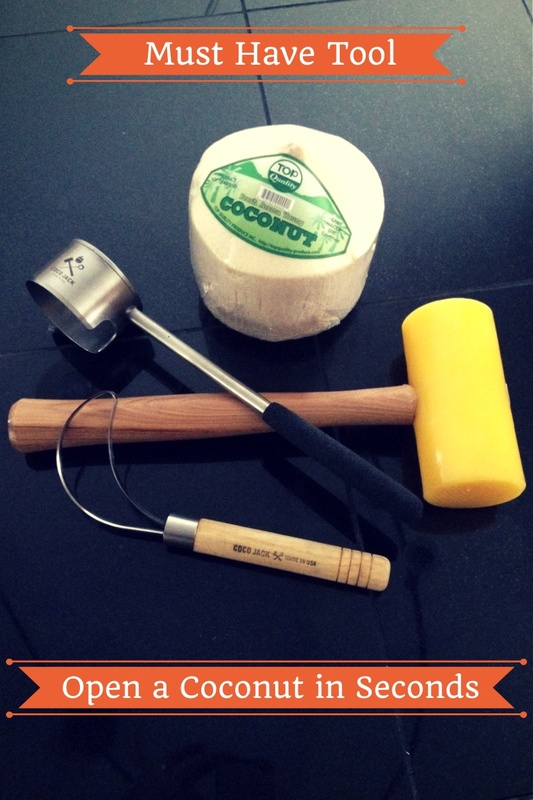 It makes opening the coconut so easy–it’s done within seconds. Just place the Coco Jack on the coconut lid, pound away with the mallet, and pop open the lid. Done. No splatters (most of the time), no danger of taking off fingers, no problems. And I love that you can put the “lid” back on if you just want to drink the water and save the flesh for later. (Or if you have a teenage daughter who only wants the water.) Also pictured is the scraper tool, which removes the coconut flesh from the sides. I still like to scrape down the sides with a spoon, but this tool is a good alternative. 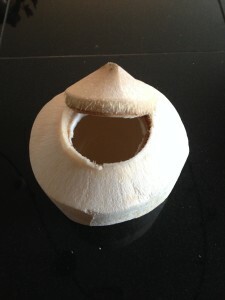 Why eat and drink a Thai coconut? The water is so hydrating, it’s better for you than any chemical-filled sports drink. You get a healthy dose of vitamins, minerals, and natural sugar. It’s higher in potassium than a banana, and contains magnesium and the right kind of calcium. The flesh is loaded with MCFA (medium-chain fatty acids), which are very easy to digest, and go directly to your liver to be used as energy, not as a stored fat. Thai coconuts contain Lauric Acid, which is antibacterial and antiviral, and very nourishing to the gut. The only other significant source of lauric acid in the diet is found in mothers milk. The saturated fat in coconuts is the beneficial fat you need for your brain to function, and is very healing to the gut. Packaged coconut water has typically been pasteurized, so many of the nutrients are killed off. There are some exceptions, but fresh from the coconut is best. There are many more reasons, but one of the most important is how utterly delicious they taste. If I can wait long enough without drinking one to make a smoothie, its my very favorite base, hands down. It mixes so well with many fruits and greens, and gives such a creamy flavor to the drink. The healthy fats keep you satiated, giving you energy, and actually help you to burn fat. What’s not to love? As for Coco Jack, you can find their ordering page here. My husband ordered the pack with the Coco Jack, the mallet, the scraper and the bag. I will be ordering these for gifts, but will probably just get the Jack and the Mallet. I like the scraper, but I still probably prefer the spoon, as coconut shapes and sizes vary, so the scraper doesn’t always fit exactly to the shape. If I practiced with it more, it is probably useful. I do like that you can order any combo that you like. The quality is great, its well-made and very sturdy. Note: You can purchase coconuts at the health food store, or at Asian markets by the case. It’s cheaper, and I’ve noticed that they’re typically the same brands for a lot less. Thank you for visiting A Healthy Perspective!